Oops, apologies I’ve not been consistent with posting these interviews each Monday! Just when you think life has calmed down a bit, it all gets crazy again. But I’m super excited to share today’s post with you – and trust me, it’s worth the wait. It’s not every day an author like me gets to welcome one of the UK’s biggest children’s and YA writing stars … but today is one of those days! Because here to share his writing and reading insights with us is the wonderful Philip Reeve. I’ve been a fan of Philip’s writing ever since picking up Mortal Engines in my local charity bookshop. I bought it on a whim based on the gorgeous illustrated cover and took it away on holiday with me. After pretty much devouring it in a day, I went out and bought the next two in the series – and let’s not even go into how expensive books are in Malaysia! – and have been hooked on everything he writes since. It’s been a real privilege hearing about Philip’s own writing and reading habits, especially as he’s gone into such detail in each question. I hope you’ll enjoy hearing about them as much as I have! 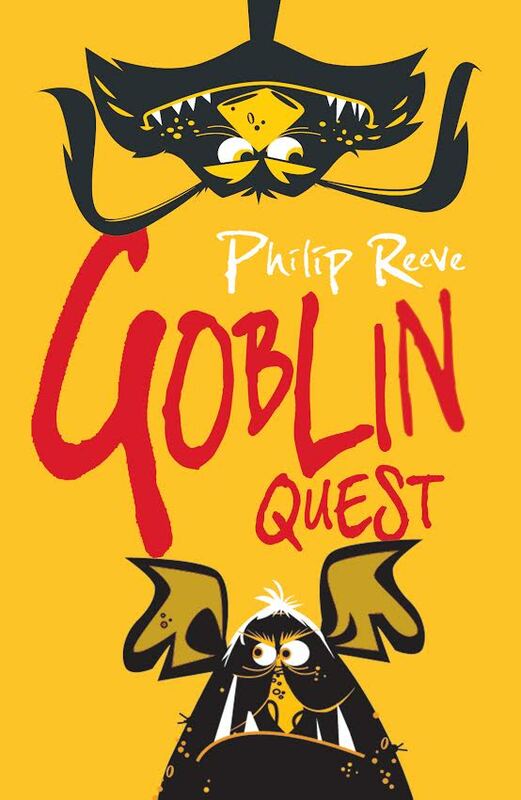 Goblin Quest is set in a fantasy world with obvious echoes of Tolkien’s Middle Earth, only the goblins get to be the heroes for a change, instead of just faceless minions of evil! I read The Lord of the Rings to my son a few years ago. It reminded me how much I loved Tolkien’s writing, and the world he created, but also how much I dislike the black-and-whiteness of it – the way all the orcs are irredeemably bad. Well, I don’t dislike it that much – I find it easy enough to ignore – but I wondered what it would be like if they were sympathetic characters too. So I set out to write something that would be a) a gentle parody of Tolkien, b) an homage to him and c) a bedtime story I could read to my son, with plenty of action and humour and poo. That turned into a book called Goblins. I thought it was just a one-off, but the publisher (Scholastic) asked for a second (Goblins vs Dwarves), and I thought that turned out pretty well – I think it’s better than the first book – so I went on and wrote a third. Pantser for sure, I never plot anything out in advance. I usually have an opening image in mind, and a couple of ideas for things that might happen further down the line, and then I just start writing and see where it goes. Usually when I’m about two thirds of the way through the first draft, I start to understand what it’s about and what the ending will be. Sometimes I get an idea for a whole story, but that’s always a disaster, I never bother finishing those. Writing is boring if you know what’s going to happen next. Goblin Quest was a surprisingly easy book to write. I know the world quite well after the first two books, and most of the characters are fairly familiar, too, so I just had to think up some new situations to drop them into. The most difficult scenes are always the ones where there are loads of characters running around and lots of things going on at the same time – it’s like keeping different plates spinning, you have to be careful not to forget anybody! But some things you would expect to be hard – killing off beloved characters, for instance – is actually easy, those scenes are quite intense and seem to flow fairly well. The quiet scenes, the happy moments, those are more difficult – it’s easy to write about people having a horrible time, but keeping the pace right when everyone is content and nothing much is happening is much harder. I really admire people who can write well about happiness and everyday things. Getting published in the first place, I guess! I wasn’t really expecting my first book, Mortal Engines, to be published, and I certainly wasn’t expecting it to be a success, so that was an amazing period. And recently, working with Sarah McIntyre on books like Oliver and the Seawigs, has been like starting all over again. I find myself on stage with her at festivals, wearing costumes, playing the ukelele (very badly), and I think ‘I used to write quite serious novels – how did this happen?’ But it’s all good, I’m enjoying the performance side of things, and I think that (along with Goblins) it’s freed me from my past to some extent. I think it’s essential to take a new direction from time to time. Well, the great thing about writers is that you don’t have to talk to them! Living or dead, you can just read their books, and learn from that way. I think when writers dish out writing tips it can often be quite counter-productive. You’re much better off just reading their stuff, and puzzling out for yourself how they handle certain problems. There are words I overuse terribly. ‘Dark’, ‘Vast’ and ‘Suddenly’ seem to crop up a lot! I usually do a search for them, and a few other offenders, when the MS is finished, and lop out as many instances as I can. I try not to talk about future books, partly because it feels like bad luck to talk about them before they’re written, and partly because my ideas may change anyway: I’m forever scrapping things. I’m working at the moment on a new novel which I hope will appeal to Mortal Engines fans, although it’s set in a very different world. 1. When and where is your favourite time and place to read? I read at coffee break in the morning, lunchtime, and teatime. I’m a creature of habit! Sometimes for a bit before bed, too. I go through phases when I don’t read any fiction – when I’m working on my own stuff it can be quite hard to concentrate on someone else’s. 3. You have a book hangover! How do you cure it? 4. If you could date any fictional character, who would it be? 5. Favourite line from a book? ‘Later, Powers often thought of Whitby, and the strange grooves the biologist had cut, apparently at random, all over the floor of the empty swimming pool.’ That’s the opening line of a JG Ballard story called The Voices of Time. It’s intriguing, absurd, beautiful, and utterly distinctive. It doesn’t make very much difference to me when I’m actually reading, but if I like a book I tend to want a nice paper copy sitting on my bookshelf. I guess that’s a very Twentieth Century thing! 7. As a child, who was your fictional hero/heroine? I think my heroes were the writers and illustrators rather than their characters. I would identify with the characters, but from a very early age I was always aware that somebody was making up these stories, and they were the people I wanted to be! My heroes were Tolkein and Rosemary Sutcliff, Ronald Searle and Goscinny & Uderzo. 8. Which is the most-read book on your shelves? 9. Describe what reading means to you in one word. ‘Escape’. I think that’s the why most people read; to be lifted out of humdrum reality for a while. Literary types tend to get a bit sniffy about that, but who cares what they think? 10. If you could recommend one book to non-readers, which would it be? A lot of adults I know don’t read fiction because they don’t enjoy it; it just doesn’t work for them. And that’s fine, it’s only an entertainment form, I get a bit tired of authors carrying on as though books are the lifeblood of a master spirit and you somehow become a better person by reading them. Watch telly instead if you’d rather! Of course, it’s important that children read, and I think that for the ones who find whole novels a bit of drag I’d recommend comics, like the ones the DFC/Phoenix has published, and also things like Liz Pichon’s Tom Gates books. And there’s a lovely book which I’d recommend to everybody, The Arrival by Shaun Tan. It deals very movingly with the immigrant experience without ever being remotely an ‘issues’ book, and there’s not a single word in it, it just unfolds across page after page of beautiful pencil drawings, like a silent movie.